Thanks to our grassroots efforts, support and passage of Measure P, leadership from Rio Americano’s Administration and San Juan Unified School District, Rio Americano High School will finally be installing an all-weather track and field facility. Fields of Dreams is a joint fundraising effort to expand and renovate all outdoor athletic facilities at our school. We need your help and support to maximize this opportunity by raising funds for adequate stadium seating and ensuring all athletic facilities are considered for refurbishment and renewal. This includes a ticket area, snack bar, renovated bathroom and storage area, as well as a new scoreboard. Football, Track & Field, Soccer, Lacrosse, Softball, Baseball and Tennis are all directly affected and impacts the entire Raider community. Donations will be recognized on the Donor Wall at Rio Stadium. We offer Sponsorship and Naming Rights opportunities. 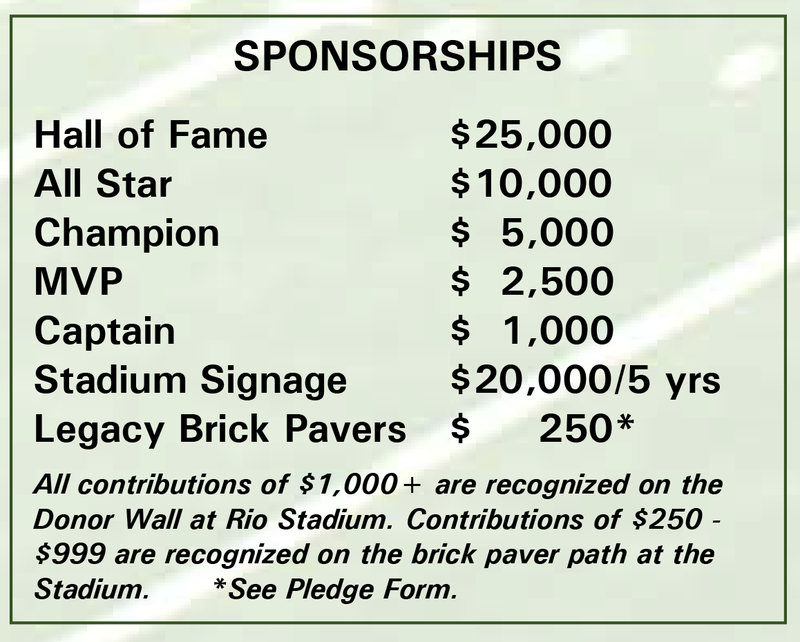 To get started, download the Rio Athletic Fields Campaign Sponsorship/Pledge form (.pdf).